NEWARK, N.J. — John Tavares, Auston Matthews and Patrick Marleau scored in the opening 13:38 and the Toronto Maple Leafs displayed all their talent with a 7-2 victory over the New Jersey Devils on Tuesday night. Nazem Kadri matched his career high with three assists and red-hot Mitch Marner and Morgan Rielly added second-period goals as Toronto embarrassed New Jersey for the second time this season and won for the seventh time in 11 games (7-2-2). Tyler Ennis scored two late goals to finish the scoring. Frederik Andersen made 27 saves in winning for the second time in his last five starts (2-2-1). 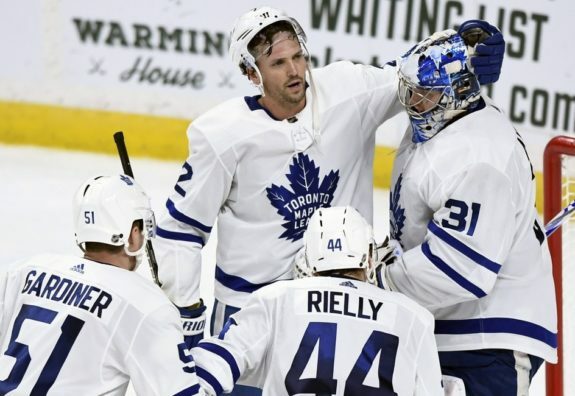 [caption id="attachment_489444" align="aligncenter" width="575"] Toronto Maple Leafs defensemen Jake Gardiner (51), Ron Hainsey (2) and Morgan Rielly (44) congratulate goaltender Frederik Andersen (31) (AP Photo/Hannah Foslien)[/caption] Sami Vatanen and Nico Hischier scored for the struggling Devils, who are 3-6-6 in their last 15 games. Keith Kinkaid gave up five goals on 21 shots before being lifted with New Jersey down 5-1 after 40 minutes. The Maple Leafs dominated the opening minutes of the game and took the lead just seconds after the Devils' killed off Blake Coleman's penalty. Nico Hischier led a 2-on-1 break into the Toronto zone that Rielly broke up, triggering a 3-on-1 counterattack. Matthews sent a pass to Kadri in the right circle and he found Tavares coming down the middle for his 21st goal at 6:01. Matthews doubled the lead less than two minutes later, depositing a loose puck into an open net. The Devils challenged the call, saying Matthews created the chance for his 17th goal by pushing defenceman Damon Severson into Kinkaid. The goal stood. Marleau made it 3-0 with 6:22 left in the period when Kadri's pass from the sideboard was mishandled by Vatanen and Kinkaid for a tap-in. Vatanen scored on a rising slap shot with 1:16 left in the period but Marner pushed the lead back to three goals, putting in the rebound of Tavares' shot that banged off the goalpost. Rielly scored from the left circle with less than a second left in the second period. Mackenzie Blackwood, who was called up from Binghamton on Monday when Cory Schneider was placed on injured reserve with an abdominal strain, made his NHL debut gave up the two late goals to Ennis.